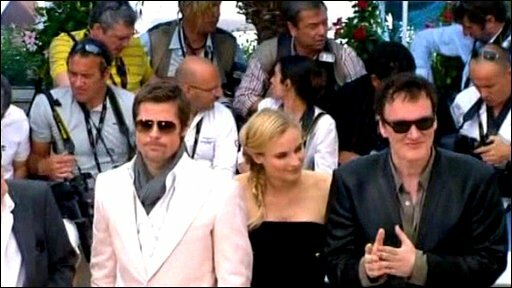 Quentin Tarantino has made an eye-catching return to the Cannes Film Festival with Inglourious Basterds, an epic World War II movie set in Nazi-occupied France. Tarantino swaps fact for pulp fiction in Inglourious Basterds, a comic revenge fantasy about Jewish freedom fighters bringing down the Nazis in 1944. Brad Pitt plays Lieutenant Aldo Raine, the leader of a gang of Jewish-American soldiers operating in occupied France whose self-proclaimed mission is "to kill as many Nazis as possible". They succeed in Tarantino's usual grisly-comic fashion, carving swastikas into the foreheads of any German soldier they do not scalp. The plot culminates with an attempt to incinerate the Nazi high command - including Hitler, Goebbels and Goering - at a film premiere in Paris. That honour goes to Christoph Waltz, an Austrian TV star who plays SS officer Colonel Hans Landa. So important was this character to the film, says Tarantino, that he considered scrapping the movie if he couldn't find the perfect actor to play him. This is not an American movie. Rather, it's Tarantino's homage to the European cinema he adores. Indeed, there are so many scenes shot in French and German that an English-speaking audience will spend a lot of the film reading subtitles. Some will wish there were a few more, just so they can understand Pitt's Tennessee-born, almost incomprehensible character. 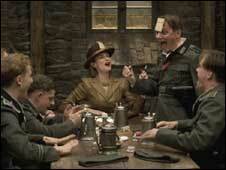 Inglourious Basterds clocks in at nearly three hours, and its director could certainly have trimmed more of its flab. This, and Pitt's character not getting the screen time he deserves, are the main disappointments. It still can't touch Pulp Fiction, which won the Palme D'Or in 1994, but the reaction here at Cannes is that Quentin Tarantino has made a glorious, silly, blood-spattered return. He is royalty at this festival - and as long as you can suspend disbelief and offence, he remains the king of trashy cinema. Inglourious Basterds is out in the UK on 21 August.